About 10 of us non-marathoning Heathsiders ventured down to Chiswick this morning for a brisk run along the river in the aptly named Thames Towpath 10. Conditions were good: partly cloudy and around 7C with a bit of a breeze. This was only my second 10-miler and I had to beat last year’s Fred Hughes time of 1:16:17. I knew that was possible, as Fred Hughes is hilly and this race was really flat. My goal was 1:15:00, which meant averaging 7:30 minutes/mile. I chunked that together in my head to aim to be under/around 30:00 at 4 miles and under an hour at 8 miles. Strategy-wise, I decided to go out at (rather than under) pace so as not to burn out in the last few miles. 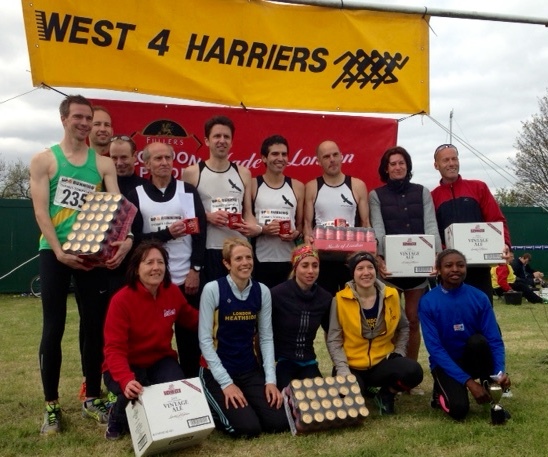 The TT10 is advertised as a ‘multi-terrain’ 10-mile race, and it certainly is. Almost half the race is along the gravelly Thames towpath (who’d have thought?!) — this made it hard to get into a good rhythm but did keep me on my toes. It was also nice to see rowers gliding along the river down below and others out enjoying the morning. Once out of the start (an awkward lap-and-a-half of a grassy football/soccer field), J and I tried to settle into a pace together. It’s great to race with training partner whose style you are familiar with. Our Garmins showed different average paces, but time-wise we were on target: just under 15:00 at 2 miles and just under 30:00 at 4 miles. Shortly past halfway, we turned off the gravelly towpath and onto…a grassy field! ‘Just pretend it’s cross country’, I said to J as we ran across the thankfully-not-muddy field. A few miles on pavement helped the legs move along as the middle miles took a mental toll. J pulled ahead of me at 6 miles as I fell a bit off the pace, but I gritted my teeth, popped a couple of gummies, and caught up with her around 7 miles. Come on, you have to make it to 8 miles in under an hour, I told myself. Pushing on, it was back to the towpath for a brief jaunt, where I finally seemed to get into a rhythm and hit 8 miles in 59:59 — right on target! Two miles to go. Fellow Heathsider R was not far ahead and I made it my goal to try and close the gap between us. We turned off the towpath and back to pavement for the final mile or so. My Garmin chirped at 15km: let’s go, only about 1km to the finish. I shouted encouragement to R as we went up and over the bridge and I stuck right behind him as we turned the corner for the last 200 meters around the grassy field. Kick, legs — catch him! But I couldn’t quite and R crossed the line just 1 second ahead of me (although our chip times are identical according to the results). My final time: 1:14:37 (average pace 7:27/mile) for a PR/PB! I came 6th woman of 214 and was the 100th finisher of 524. Plus, J finished right behind me and another Heathsider, S, came in 10th woman — combined, our finishes won us the 1st ladies’ team prize. Can’t complain about that! The Thames Towpath 10 was a very well-organised race with fantastic marshals and a pretty nice haul of goodies: everyone got a Fuller’s (they sponsored) pint glass, many of us scored colourful buffs/snoods, and winners got a coffee mug and a case of Fuller’s London Pride beer (F was quite pleased about that!). Not bad for a morning’s run! 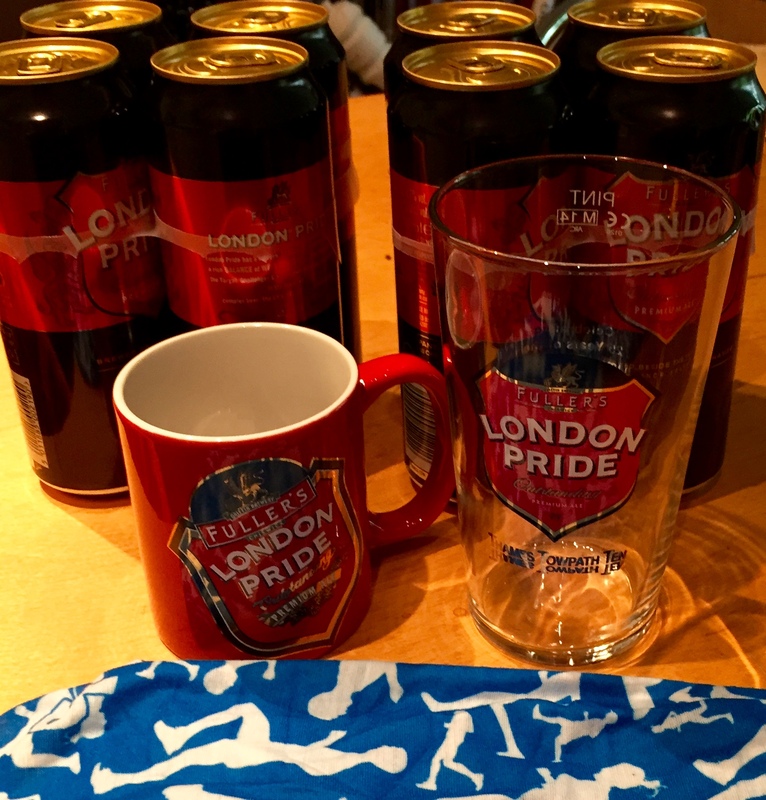 This entry was posted in exercise, health, Highlights, pictures, Race Recap, running and tagged 10 miles, beer, Chiswick, Fuller's, London Heathside, race, running, Thames on 19.04.2015 by taplatt.